Synopsis: Mystery writer Peter Allison (David Manners) and his newly-minted wife Joan (Julie Bishop) are honeymooning in eastern Europe. On a train trip east, they are unexpectedly asked to share their compartment with a stranger, Dr. Vitus Werdergast (Bela Lugosi). Werdegast tells them that he had been in a Russian prison camp until recently, but now he is on his way to visit an old friend. The man seems haunted by Joan's beauty, telling her that she reminds him of his own late wife. At their destination, Werdegast and the Allisons agree to share a taxi. The driver entertains the newlyweds by telling them that the area they are driving past was the site of an old fortress, where 10,000 men died in a fierce battle with the Russians during the Great War. To the couple this is mildly interesting history, but Werdegast stares out the window darkly, and it is clear that for him this story is all too personal. Suddenly part of the rain-washed road gives way and the taxi plunges down an embankment. The driver is killed in the crash, and Joan is knocked unconscious. Werdegast, his manservant and Peter take her to the futuristic house built on the ruins of the old fortress. This is the house built by Hjalmar Poelzig (Boris Karloff), one of the world's greatest architects and the man whom Werdegast has traveled so far to visit. Poelzig had once commanded the fortress the house was built upon, and it quickly becomes clear that Werdegast's visit is not entirely a social call. During the war, Poelzig had allowed his men to be taken captive by the Russians in exchange for his own safe passage. And Poelzig had taken Werdegast's wife Karin with him. He had told her that Werdegast had been killed so that he could marry her and raise Werdegast's daughter as his own. Wedegast treats Joan's injuries, telling Peter that she will be all right after a good night's sleep. He gives her a sedative. Peter and Werdegast are talking to Poelzig when Werdegast sees a black cat. Werdegast becomes hysterical and kills it. Poelzig explains to Peter that Werdegast has always suffered from a debilitating fear of cats. Joan comes downstairs. She seems different than before -- more somber and sharp-eyed. When Peter takes her back upstairs she kisses him hungrily. Wedegast explains that the narcotic he has given Joan is known to cause incidents of expanded perception, even second sight. Later that night, Poelzig tells Werdegast he will take him to Karin. The two go into the lower levels of the house, which are built upon the old fortress ruins. Poelzig leads him to a glass case, where Karin is kept. Poelzig tells him that she died of pneumonia shortly after the war. But he has kept her body perfectly preserved so that he may always look upon her beauty. The child, he tells Werdegast, died about the same time. Enraged, Werdegast draws a pistol, but Poelzig mocks him for his "childish" and "melodramatic" impulses. Realizing that this isn't yet the proper time to exact revenge, Werdegast stands down. Comments: Tonight we are treated to a top-notch double feature -- the best, in fact, that Horror Incorporated has offered to date. 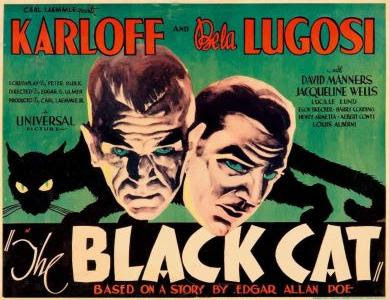 First up is Edgar G. Ulmer's The Black Cat, a florid and highly stylized thriller that makes great use of its two stars, Boris Karloff and Bela Lugosi. From the very beginning, the movie is out to buck convention. It is a horror film set not in a crumbling castle but in a gleaming modernist house; while most films of the era had almost no music, this one has few moments without it; and while most horror films of this type were set in the distant past, this one is set in modern times, with a revenge subplot rising from the blood-soaked battlefields of the Great War. The mood it creates is very effective, and while modern viewers are likely to see it as tame stuff, in its day it was seen as having an unsavory focus on torture and cruelty. "Clammy and excessively ghoulish," complained the New York Times when the film premiered in May of 1934. "'The Black Cat' is more foolish than horrible. The story and dialogue pile the agony on too thick to give the audience a reasonable scare." Time Magazine groused, " A dismal hocus-pocus which seems to confuse its actors as much as it fails to frighten its audience.....cinema's two outstanding blood-curdlers deserve a better vehicle than The Black Cat". Variety, as you might expect, had the funniest take on the movie, writing "Clash of the two eyebrow-squinting nuts involves an American bridal couple temporarily caught in the manor. It is the playful notion of nasty Karloff to make the bride Exhibit A in a devil cult of which he is the head, and it is the revenge of Lugosi to torture his enemy by skinning him alive". Ah, good times. As often happens, audiences ignored the wisdom of the film critics, and The Black Cat was a hit at the box office. It's regarded as a classic of the horror genre, and rightly so -- not only does it successfully create an atmosphere of wonder and foreboding, it successfully captures the spirit of Poe even as it entirely discards the story it's ostensibly based upon. Heavy on mood and imagery and short on plot, this is the sort of film I can imagine Poe falling in love with, going to see again and again. I like to think that Poe would have been a great fan of the movies. He was just born a hundred years too late. Synopsis: A spectacularly unsuccessful sculptor named Marcel De Lange (Martin Kosleck) is dining on bread and cheese by candlelight. It's bread and cheese because he doesn't have anything else to eat; and it's by candlelight because the electricity in his loft has been shut off. But he is in good spirits because a wealthy patron of the arts is coming over soon to buy his latest creation for $1,000. But when the patron arrives, he is accompanied by a supercilious art critic named F. Holmes Harmon (Alan Napier) who insults the work and implores the buyer not to go through with it. The sale is ruined. Despondent, De Lange walks down to the river bridge. He is about to throw himself in when he sees a half-drowned man surface near the riverbank. He goes down to help the large, ungainly fellow out of the water, and returns to the loft, where he nurses him back to health. He sees this man as "the perfect Neanderthal" and is inspired to create a new sculpture of his primitive cranium. 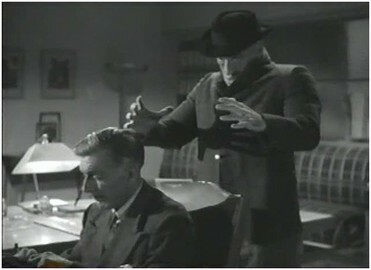 It turns out that the stranger is an escaped murderer called The Creeper (Rondo Hatton), and his m.o. is to snap his victim's spines. The police believe he is dead, and at first it isn't clear to De Lange what sort of man he's taken into his home. But it becomes clear soon enough: The Creeper murders a streetwalker in the neighborhood (because "she screamed", as the Creeper succinctly explains), and when De Lange angrily reads Harmon's snarky write-up of his foiled sale, The Creeper gets up and leaves. Meanwhile, reporter Joan Medford (Virginia Grey) visits her colleague F. Holmes Harmon. She is upset that Harmon plans to write a savage review of her boyfriend Steven Morrow (Robert Lowery) and his planned exhibit of commercial illustrations (pinups, which appear to be Morrow's speciality). Harmon finds pop art in general to be contemptible, and Morrow's work particularly vulgar; he is determined to ruin Morrow with another poison-pen letter to the art world. Enter the Creeper. He kills Harmon and slips away. Because Harmon was working on a hit piece against Morrow when he died, police suspicion falls on him. De Lange realizes that all he need do is express contempt for an art critic -- or anyone, really -- and hey presto, he reads that person's obituary in the next day's paper. Bringing the Creeper into his life has given him an incredible feeling of power, and if that weren't enough, his sculpture of the Creeper is going well -- in fact, we suspect it's the first decent piece of art he's ever created. As the body count rises, Medford visits De Lange's loft. She says she is looking for a story for her Sunday column -- but is she? Why does she steal a sketch of the Creeper that De Lange has hidden? And what will happen to her when he --and the Creeper -- find out? Comments: It's hard to imagine a more interesting counterpoint to The Black Cat than Jean Yarbrough's House of Horrors, coming as it does from the end rather than the beginning of Universal's "golden age of horror". Ulmer's film benefited from lavish production values, a tone borrowed from the German expressionist films of the 1920s and the presence of Karloff and Lugosi, two actors then at the peak of their careers. House of Horrors had no stars, and was shot in the most straightforward and pedestrian way possible, and its overall look and feel suggests the lowest of low-budget Universal features of the time. 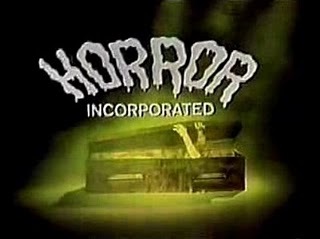 And yet House of Horrors is in its way just as lurid and disturbing as the better-known Ulmer classic. 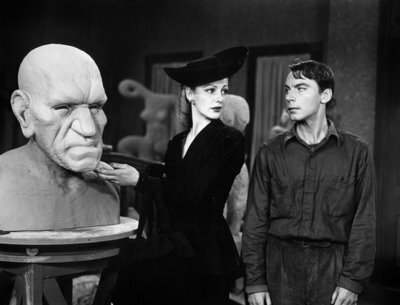 Perhaps this is due to the presence of Rondo Hatton himself, whose acromegaly is displayed for the paying audience in a way that reminds us too keenly that all horror films are freak shows in sanitized packages: we're separated from the grotesques by a glowing screen, but all the same we lay down our money and can't stop gawking. And perhaps part is due to the fact that the Creeper, casually presented to us as the logical successor to Dracula and Frankenstein and the Wolf Man, isn't anything like them. The Creeper claims no supernatural origin, nor does he have any claim to our sympathy. Sympathy is what we must feel for the great screen monsters, sooner or later; they have become what they are through no fault of their own, and we can imagine a time when these creatures were like us. We should have no such illusions about the Creeper. It's difficult to imagine a time when he wasn't a remorseless killer. In his place we have Marcel DeLange, a talent-free sculptor whose failures and humiliations have led him to the brink of suicide. The Creeper arrives just in time to give him a reason to carry on -- providing him not only with an artistic muse, but with a vehicle for revenge. The moral choice in this film is assumed entirely by DeLange, and he does not hesitate: his rage and bitterness, strong as they were, were never stronger than his moral cowardice. But the Creeper gives him a way to exact revenge, and DeLange clearly believes that he needn't pay the moral price because he never explicitly asks the Creeper to commit murder -- he simply wishes openly for the death of someone in the presence of the Creeper, and the deed is as good as done. He's off the hook! But DeLange is wrong. He is on the hook, all the way on, and the moral price always gets paid. We know this because we're watching a horror film, and horror films have rules, but DeLange is unaware of the rules. DeLange's ignorance, of course, his greatest liability -- just as Werdegast and Poelzig's greatest liability is their too-great knowledge of the moral precipice they have reached. Werdegast and Poelzig had each clearly made a decision - long before the events of the movie began - that when the time came he would take the other guy with him. 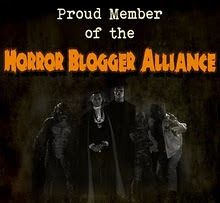 That's great dramatic stuff, but for House of Horrors it never occurs to either character to take the other guy with him. Not until it's too late. You always manage to find something interesting to say about horror films that have been discussed for decades. THE BLACK CAT probably has greater resonance for Lugosi fans than Karloff fans (John Carradine fans can spot him at the organ). Somewhat cast aginst type, excelling at playing sympathetic monsters, Boris plays what may be the most evil character he ever did. Coming off the wicked Count Ledrantz opposite George Arliss in THE HOUSE OF ROTHSCHILD, he was reluctant to so soon return to horror, but the role, and its exotic wardrobe, proved to be irresistible. 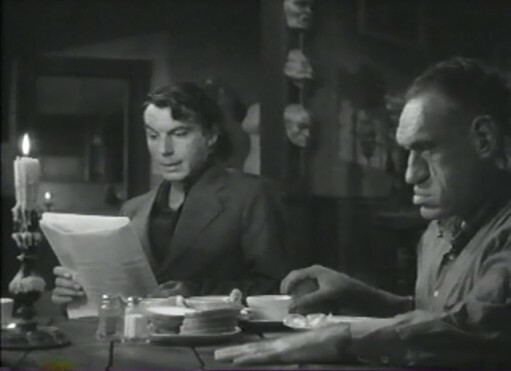 Bela rarely had the chance to handle sympathetic characters, but he does very well in 3 of his 4 starring turns opposite his British counterpart (including SON OF FRANKENSTEIN). Their styles may have been quite different, but they provided sparks on screen together, each deserving of their honored horror status. 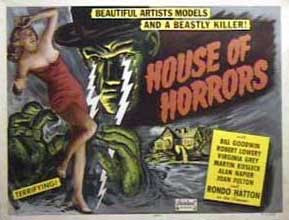 HOUSE OF HORRORS is generally regarded as the best from Universal's dying days of horror in 1945-46. Rondo Hatton's countenance remains more famous than his acting, while Martin Kosleck received more fan mail about this title than any other he ever did (although he made few films after 1948). The best moment was watching the sculptor's beloved cat coming down the steps in the background, while in the foreground his master was being strangled by The Creeper. Director Jean Yarbrough had to deal with weak supporting characters (especially the hopelessly obnoxious female reporter), but his handling of barely lit sets and a quickie schedule is deserving of some praise. His other genre credits include 1940's THE DEVIL BAT (Lugosi), 1946's THE BRUTE MAN (Hatton again) and SHE-WOLF OF LONDON, and his final feature, 1967's HILLBILLYS IN A HAUNTED HOUSE (John Carradine, Lon Chaney, and Basil Rathbone). I'd forgotten about THE DEVIL BAT, which is probably PRC's ritziest horror flick. It never made any sense to me that Martin Kosleck got fourth billing in HOUSE OF HORRORS, since he carries a good deal of the film himself, and the so-called stars were as bland and colorless a bunch of C-listers as you could imagine. It's a shame that Kosleck didn't have more of a career; he's terrific here. The terrible dialogue made the top three even worse; how many people talk about what it's like to be a thumb twiddler? Martin Kosleck made such a good villain that he was often wasted in such roles: CONFESSIONS OF A NAZI SPY (George Sanders), FOREIGN CORRESPONDENT (Hitchcock), SECRETS OF SCOTLAND YARD (Lionel Atwill), JUST BEFORE DAWN (Crime Doctor)- All offered his villains little screen time. At least at Universal, he was treated like a star, and looked back on those two years with great fondness. He also did RAIDERS OF GHOST CITY (serial), THE FROZEN GHOST, THE MUMMY'S CURSE (both with Lon Chaney), PURSUIT TO ALGIERS (Basil Rathbone, with whom he previously did THE MAD DOCTOR), and SHE-WOLF OF LONDON. Later genre titles included AGENT FOR H.A.R.M. and the notorious THE FLESH EATERS, plus TV roles on THRILLER, BATMAN, and SANFORD AND SON ("Sergeant Gork," where his last Nazi plays tape recordings strapped to his leg). I remember phoning him in Hollywood in 1982, hearing his distinctive tones answering on the other end, also speaking with Christopher Drake, who had appeared with him in THE FLESH EATERS (like HOUSE OF HORRORS, CHILLER THEATER introduced me to both).